Loretta Lynch Confirmed as Attorney General, Bad News for RAWA? 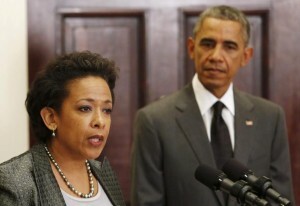 Home » Post Archive » Loretta Lynch Confirmed as Attorney General, Bad News for RAWA? Loretta Lynch is now officially the 83rd attorney general of the United States, the second woman to hold the position and the first African-American female, and while Republicans agree she is qualified for the job and Democrats feel she is a worthy replacement of Eric Holder, her opinions on key issues affecting America remain to be seen. Key stakeholders on both sides of the online gambling debate are primarily concerned with Lynch’s views on the Restoration of America’s Wire Act (RAWA), but so far she’s commented little on the legislation. Following President Obama’s nomination, Lynch fielded questions from the Senate Judiciary Committee in January where Sen. Lindsey Graham (R-SC) inquired on her Internet gaming position. At this point, the RAWA debate is more of a debacle as politicians continue to discuss a highly divided piece of legislation that appears very unlikely to gain support before the 2016 elections. The bill was skipped over last December during Congress’ must-pass omnibus spending bill, and the hearing in March by a House Judiciary subcommittee was largely deemed to be short on facts and long on fear mongering. Lynch’s confirmation won’t change Congress’ mixed feelings on RAWA, and in fact it might diminish the bill’s already slim chances. In her written remarks after Sen. Graham’s questioning, Lynch said she would review the Wire Act ruling but hinted that reversing the Department of Justice’s Office of Legal Counsel (OLC) opinion would be unlikely. “Unless in the course of my review I conclude that OLC’s interpretation of the Wire Act is unreasonable, I do not intend to take any action to suspend or revoke the opinion,” she concluded. Born in 1959 in Greensboro, North Carolina, Lynch attended Harvard for her undergrad, earning degrees in English and American literature. She wasted no time in pursuing her dream of becoming a lawyer, earing her JD from Harvard just three years later. After working for a private New York-based firm, Lynch spent the next 11 years employed by the US Attorney’s Office for the Eastern District of New York. In 1999, Bill Clinton appointed her to the role of US attorney for that same district, a position she’d leave in the fall of 2001 to reenter private practice. After President Obama persuaded her to rejoin the Eastern District and once again serve as US attorney for the region in 2010, he nominated her to replace Eric Holder on November 8, 2014.